The Milky Way and a Karl G. Jansky VLA dish antenna in Socorro, New Mexico. Shami Chatterjee et al. 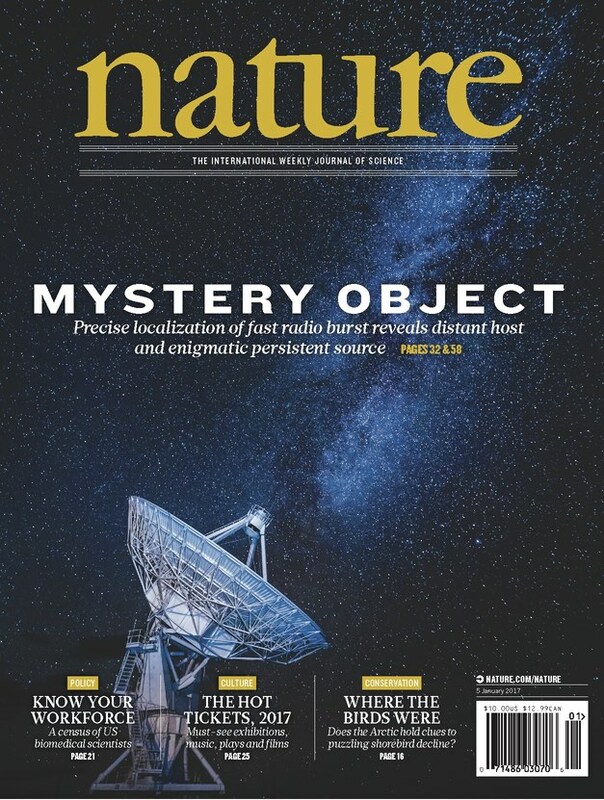 report the subarcsecond localization of the Arecibo-discovered fast radio burst FRB 121102, the only known repeating burst source, using high-time-resolution radio interferometric observations that directly image the bursts. FRBs are radio flashes of unknown physical nature with durations of milliseconds. Previous observations have lacked the resolution to uniquely identify a host or multi-wavelength counterpart. The localization of FRB 121102 reveals a persistent radio and optical source that is coincident with the bursts to within 100 milliarcseconds. The enigmatic persistent source could be a neutron star within its nebula in a distant host galaxy, a low-luminosity active galactic nucleus, or a previously unknown type of extragalactic source. Cover: Michael Spain / 500PX/National Geographic Creative. 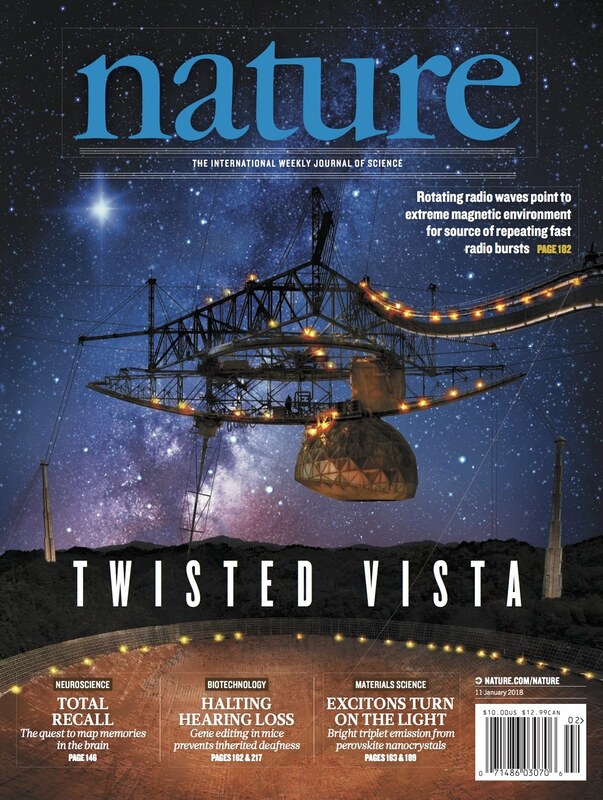 The cover shows the William E. Gordon Telescope at the Arecibo Observatory in Puerto Rico. Jason Hessels and his colleagues used the telescope in their attempt to clarify the physical nature of the only known source of repeating fast radio bursts. Lasting about a millisecond each, these bursts come from a star-forming region in a dwarf galaxy. Hessels and his co-authors observed that the bursts were nearly 100% linearly polarized and had a very high Faraday rotation measure. Such results require the presence of an environment of extreme magnetized plasma, which has previously been seen only around massive black holes. As a result, the authors suggest that the radio bursts possibly come from a neutron star in such an environment (although the team notes that, in principle, the bursts could originate from a neutron star surrounded by either a highly magnetized wind nebula or a supernova remnant). Image: Image design: Danielle Futselaar; Photo usage: Brian P. Irwin/Dennis van de Water/Shutterstock.com. Last Modified: Shami Chatterjee, 2018 July 11.